Chances are, if your child is out of school, we’ll be running a Quest! 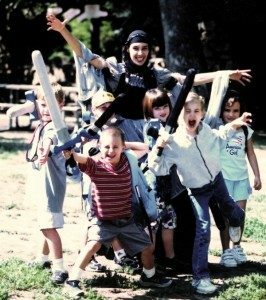 Our Thanksgiving and Winter Break Adventure Quest™ programs incorporate themes like gratitude and generosity, while our ever-popular Halloween quests lead kids on adventures where they can overcome skeletons, zombies, ghosts, and other spooky creatures. Hark ye! Thanksgiving Break, Winter Break, and Spring Break Quests are very popular and sometimes fill up quickly, so register early. We also offer many one-day Quests on other school holidays. Please see our Program Calendar for details, and sign up on our mailing list to hear about upcoming programs. Want to be notified about our holiday program offerings? Sign up for our newsletter, and we’ll let you know each time we have one coming up.